Photo of Howard Estep as a teenager. A student of Corbin High School, Corbin, KY, ca. 1936. Howard Estep was born on September 28, 1921 in Whitley County. He was the son of Garrett H. Estep and Elizabeth Rowlett Estep of Corbin, Kentucky. His family and friends referred to him as “Bug”. According to Howard's sister Pat, "The nickname was given to him by his grandfather when he was just a toddler. The name stuck! The name Bug seems more natural to my own family than his birth name, Howard." "Bug", a Corporal in the Army Air Corp, was killed on June 17, 1943 and is buried in Corinth Cemetery in Corbin, Kentucky. Details of his life were difficult to locate until Pat O'Neal, his sister, contacted Mrs. Doolin. Below her words, pictures and materials - generously shared. We feel that the best way to do Mr. Estep justice is to bring his story from one who knew him - his loving sister. 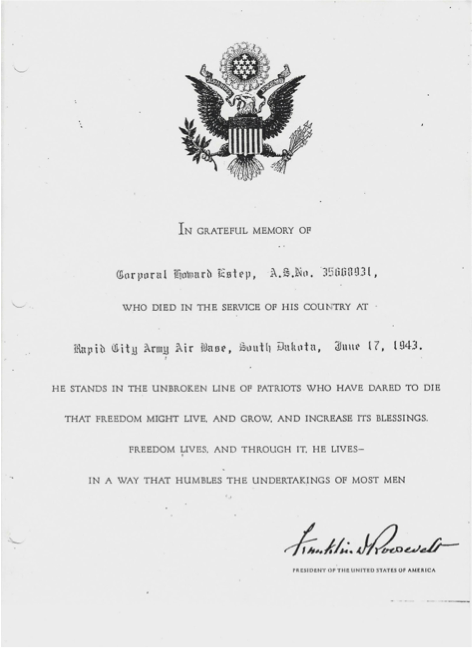 "He joined the Army Air Corps in September of 1942 and died June of 1943, so he was only in service nine months. He was married to a beautiful young lady from Stanton, KY. She, too, had wonderful natural musical talents. She played a piano like Roger Williams (one of my favorites). Their baby girl, Diane, was born one month before he entered military service. Bug was up for promotion of Sergeant and would be flying overseas in six weeks to join the fighting forces...when his plane crashed. Bug was from a family of seven sibling sisters and one baby brother, Don. Times were tough in those days, even for the average American family. I don't know his reasons for leaving school in the 9th grade, but I can only guess that he was bored and ready to get on with his life. He wanted to find a job and support himself. A family of our size needed the extra money. The truant officer spent more time looking for Bug than any other students. Bug could be found sitting on a tree limb of a tall tree at the top of the hill in front of our house, playing his guitar and singing. Everyone knew where he was except my mother and the truant officer! He got a job working at the Eveready Café in South Corbin. Each morning he left the house with his sisters and neighborhood kids on their way to school. They separated along the way and he went to work while they continued their trek to Corbin High School. Each afternoon, his boss let him leave work in time to join his friends coming home from school. My mother never knew until one day a friend slipped and told her that Bug was not attending classes. 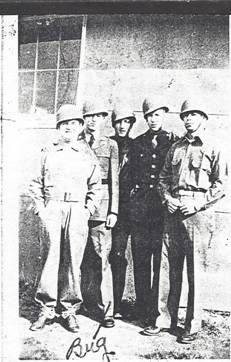 After President Roosevelt made the announcement that fateful Sunday morning that the Japanese had bombed Pearl Harbor, Bug and his friends went straight to the enlistment office to join the army. Bug did not qualify. Several months later, he was accepted by the Army Air Corps. He was extremely proud! I was just a little girl when my brother, Howard Estep, age 21, died on June 17, 1943, in a B-17 plane crash in Rapid City, SD. It was 55 years later that I learned the true story about this tragic accident. I have documented the story as it happened to my family during the war years, and again, when I was privileged to go with seven others to Rapid City in 1998 to a VIP memorial for six soldiers who died in that plane crash. I learned the details at that time about my brother's death. I talked with one of the soldiers who was a survivor of this horrible plane crash. This man was pronounced dead and brought back to life by the dedicated medical staff. He spent three years in hospitals recuperating from severe burns. This changed his life completely. I also talked with a 73 year old man who saw the plane crash. He was eighteen in 1943 and had just enlisted in the US Navy. "Bug was 21 and the father of a nine-month old baby girl. She was a beautiful young lady, very talented. She died at the age of 27 of Diabetes. I have been searching for the letters my brother wrote while in the Air Force. I thought the students might like to add one or two. They are mostly personal, but now and then he talks about his experiences in the military, just tidbits of interest. My brother wasn't the average young man, at least, I don't think he was. He wasn't involved in high school sports, so to speak. His love was Music. He was playing a guitar at the age of eight and began writing his own music. He was asked to entertain at the local mayor's birthday party. At the age of 12, he was teaching neighborhood boys to play the guitar (Fifty cents a lesson). My mother used to compare his talents with that of Chet Atkins. Although Bug dropped out of school at the age of 16, he scored at the top of a class of 300 in every exam during his pilot training in the military. He wasn't a Hero. He was just another young soldier who loved his country and therefore, gave his life for our freedom. To tell the truth, I couldn't even find his death records. A researcher from New Jersey found the records regarding the plane crash. I have always considered Bug and the five men who died in the blazing B-17 bomber crash the "Unsung Heroes". Their names are not engraved on a wall in Washington, D.C. or anywhere else. I just found Bug's letters written during the nine months he served in the Army Air Corps. I will copy a couple of them and forward to you. I believe the letters will add a more personal touch to his story. Dear Mom, Well I’m dressed up in uniform now. I look okay. I guess I made an awful good score on my intelligence test. You have to make 110 or over to be eligible for Officers’ Training. I made 117 and 114 on my Mechanics test. I got in the air corps because I made such a good grade…Only two made a higher score than I did out of over 300. Howard Estep has finished his training at the Amarilla Army Air Training School, Amarilla, Texas, and has just been promoted to the rank of Corporal. Corporal Estep has been assigned to another advanced training school at Seattle, Washington, which is said to be the largest school of its kind in the world. At this training station he will undergo an intensive five weeks training program. Corporal Estep writes the he likes his new location fine and that Howard Gaddis, a friend of his has been with him since their induction into the U.S. Military Services. He says he would like to hear from all his friends back home. He is the son of Mr. and Mrs. Hobart Estep, formerly of Corbin and now living at Clinton, Tennessee. Corporal Estep is married and has a child. His wife and child are living with her parents at Stanton, Kentucky for the duration…. There was no date on the article but it was probably written in early 1943. Boeing was building B-17 bombers with as many as 250 planes a month coming off the assembly line. The B-17s were called “The Flying Fortress, Queen of the Skies.” Howard believed the B-17 was indestructible. I graduated Thursday and was selected along with seven others as crew chief, quite an honor don’t you think? I don’t want you to worry because I’m going to fly, it’s safer than being on the ground. I don’t want to boast but the Army thinks we’re too valuable to risk in combat…. Well, I defeated over 150 men in getting this, most of them college men. Maybe it’s because I have such fine parents. My base pay will be Sgt. With an extra 50% for flying. I’m broke now, though. Ha! …Well for the last five days I’ve made E’s. I have 3 more than anyone in my class. Here’s one thing I know you’ll be glad to hear. I won’t get to fly in combat when I go over. The army seems to think we’re too valuable to risk. That’s an honor in a way, I don’t like it though. For the lack of someone with my experience 120 planes sat on the ground during an all out raid on Africa. It was a simple defect but the planes couldn’t fly with the voltage regulators burning out the generators. There’s such a shortage of men over there that not one over there could set them. I could have fixed them all in two days. I will get to fly while I’m in the U.S. The war may be over before I get over there. So you wait four months before you start worrying…Tell Dad I’ll be glad to tell him all I know about an airplane. He’ll be surprised about a lot of things. Tell Velma I get my silver wings in a few weeks. Love, Bug. This letter written May 17, 1943, came to my family from Seattle, Washington. I’ve been in school three days now and I like it fine. It’s the best it possibly could be. The instructors are the best men Boeing has and they really try to teach us something. We learn quite a lot, too. One of them told us that we needn’t worry about a job after the war, Boeing would give us good jobs. Here’s a couple of things Dad might like to know about the Fortress. You know I’ll have one in my care when I’m through here. “This isn’t a military secret.” They have added two more 50-caliber guns in the nose, 3 in all, and they have tested the plane to fly with “10 tons” of bombs. Two block busters strapped to the wings. It will fly above 40,000 feet and as far s being attacked, it hasn’t a blind spot. It has a total of 12 50-caliber guns. There’s no question it’s the finest ship in the world and I feel honored to have the chance to be one of its crew to fly with it and see that it’s well taken care of. Hitler’s babies just can’t harm this plane. It will fly on any one of its four engines too. We had a technical order which has over 400 pages and it tells every little detail about the plane. We go to school 8 hours a day and study 4 hours at night so you can see we’re very busy. They feed us like kings and treat us like men here. Everyone likes it here and you can bet when we leave with a plane, we will be able to take care of our job. Hitler can’t last long with these babies on the job. They came off the line pretty fast too…. I’ll have to close so write often. Love, and don’t worry about me. Bug. There are many letters in the old shoebox, most of them expressing his desire to make his family and his country proud of him. This was a young man who dropped out of high school in the ninth grade and went on to excel in one of the most important jobs he could ever have. Less than three weeks after this May 17th letter was written, Howard Estep died in a B-17F plane crash. Photo of Howard Estep, 1941, with his brother, Don. See attached photo of Bug with his eight siblings, 1941. Siblings: Inez Young-Corbin, KY, Ada Witt-Corbin, KY, Velma McGuire-Smithville, TN, Bena Mae Seivers-Clinton, TN, Janette Sharp-Elkton, KY, Wanda Steele-Corbin, KY, Patricia O'Neal-Lexington, KY -little girl in white dress and white shoes), Don Estep-Corbin, KY.
Last letter written by Elizabeth Estep to her son, Howard “Bug” on June 16, 1943. The envelope was marked “Return to (Clayton) Clinton, Tenn.” Unopened. My brother never got to read this letter. I guess you are wanting to hear from home by now. This leaves us all very well. We sure are having hot weather here, runs around 90 and 100 Deg’s. for two weeks. I believe this is the hottest place I’ve ever been…. Dad works every day. He’s standing it fine, lots better than I ever thought he would. He worked 37 days straight. He hasn’t a foreman’s place yet but is expected to get it any day now. There is sure plenty of work here. They say it’s the biggest job in the U.S. now. This town can’t take care of 1/3 of the people. It’s kinda hard at times to get eats here and is sure high too. Well son, we just can’t tell you how proud we are of you. You know your dad’s greatest desire was to make something big out of you and you know he’s really pleased with your rating. You know he wanted you to be a civil engineer. Well you haven’t missed it much, just an airial instead but the most I’m interested in is your getting back home to stay and I’m just hoping and praying for that to be soon. Well, our family is small now, just the 4 kids are here with us. Velma and Ben are with Inez. Velma is going to work at the dime store again…. Your dad’s brother from California has been here nearly 3 weeks. He is working with Dad or on the same project…He’s a dandy. Don’t seem to be any kin to Dad whatever. They don’t favor a bit. Wiley is the one you haven’t never seen him. He’s 61 and acts like he’s about 30. He kindly gets on Dad’s nerves. He likes a lot being the man your father is. Bug, you told me the day or two before you left that you had some insurance made to me. If you did I never have got any papers or anything about it. I would like to know whether you did or not. Of course that is something I’m hoping that will never happen but in case it did, it would show your appreciation of your parents. It’s so hard for me to write to you. I have to make 2 or 3 trials before I can write you a letter. It makes me feel so sad. I have to write through tears. Be a good boy and do be careful. You don’t know how I want to see you son and I’m hoping it won’t be long. The kids talk so much about you. They are growing so fast. Don is a great big boy now (age 3-1/2). He said to tell Bug I’m a big man and a good boy. He’s awful sweet. Everybody says he gets more like you every day. He sure has ways like you…. 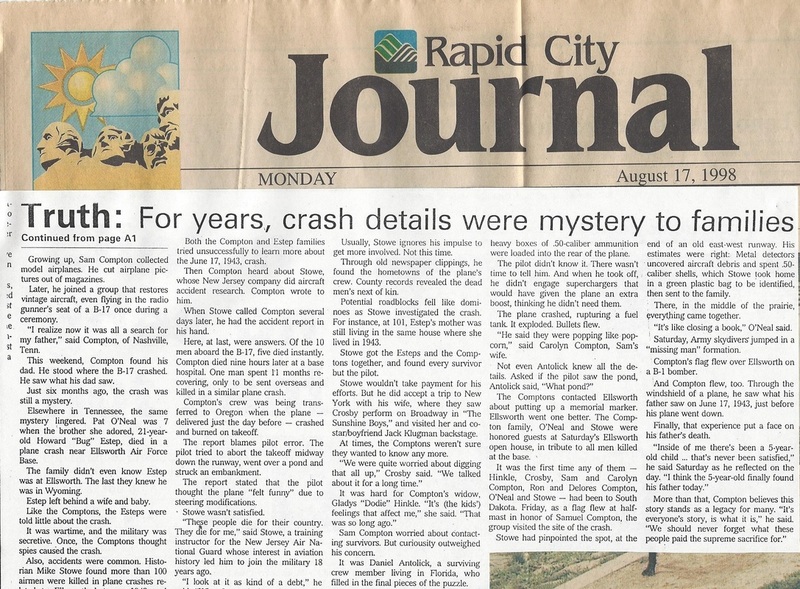 Also, I have already written the story of my trip fifty-five years later to Rapid City, SD, to the crash site where my brother died. I believe it will provide the closing of the life of one young man who served his country with honor and gallantry during war time. I will try to condense the story for the students to use. I was a little girl, just celebrating my seventh birthday in 1943 when news came to my parents that my brother, Howard Estep, had been killed in a B-17 plane crash in Rapid City, SD. “The plane crashed into the side of a mountain.” No other information was provided. Even after all these years, there is no way to describe the emotions of the tragedy and the loss of a family member during war time. By the time my family learned the entire story of the plane crash, fifty-five years had passed and both my parents were deceased. Howard Estep was a Crew Chief. His duties were to fly with one airplane on all its missions. This was how the military kept track of all their airships during the War. The B-17F bomber was eighth in a formation of ten planes leaving Ellis Army Air Base at Rapid City, SD. The first seven take-offs were normal. A crew of ten was aboard the eighth plane as it extended the east/west runway. As the pilot pulled back on the controls, he noticed the plane did not have the normal feel. Modifications had been made. Also, just before take-off, a heavy, flammable fuel tank had been mounted in the bomb bay, and 20,000 rounds of 50-caliber ammunition were loaded in the section occupied by six of the ten men. The pilot was not aware of the extra weight in the bomb bay area. As the plane taxied down the runway, the pilot made no attempt to apply the superchargers. Suddenly, he realized the aircraft could not make the lift so he must abort the flight. The B-17 was nearing the end of the runway at a speed of 110 miles per hour. A field of grass lay up ahead. The pilot cut the throttles, killed the ignition, and applied the brakes hoping the plane would continue across the field and come to a smooth stop. This would have been just another incident had it not been for a pond that lay 330 feet beyond the runway which was not visible from the cockpit. The aircraft skidded past the end of the runway then sailed over the pond to impact the bank on the opposite side. The navigator was immediately thrown through the nose of the plane. The quick-witted aerial engineer called to the co-pilot, telling him to get out. But the co-pilot sat motionless, staring back at him. His next move was to check on the crew in the bomb bay. He opened the door and flames shot forward. The entrance to the bomb bay was consumed by fire, so the engineer tried to close the door to keep the flames from entering the cockpit. An explosion threw him forward. He yelled to the co-pilot to jump through the hole in the nose of the plane while the pilot moved toward the cockpit window. Climbing up behind the pilot, the metal was too hot to touch, so the engineer pulled himself out of the window by using his wrists. Next he jumped to the ground and rolled in the grass to extinguish the flames from his flight jacket. His hands were severely burned but at this point there was no pain. The speed of his actions was vital. Giving no thought to the extent of his own injuries, he ran toward the rear of the plane. SSgt Sam Compton, Sr. was sitting hunched on the grass. Compton had evidently climbed out through the gunner’s hatch. Calling out to Compton, he received no response. The burning aircraft was now engulfed in flames and heavy black smoke. Ammunition was exploding everywhere. Fire trucks and rescue equipment responded to an immediate call. Workers were unable to get near the burning plane. The surviving crew members were quickly pulled away from the plane and transported to the army hospital. SSgt. Compton died nine hours later of 80% burns. Upon arrival at the hospital, the aerial engineer’s heart stopped beating. He, who had fought so forcefully to save his crew, was pronounced dead, but the speedy efforts and CPR procedures by the surgical staff soon had his heart beating again. The engineer would spend three years in the hospital recovering from 40% burns. Numerous surgical procedures would be performed on his back and his hands. Along with my brother, Cpl. Howard Estep, and SSgt. Samuel Compton, Sr., the other four men who died in the plane crash were 2nd Lieutenant Richard Billman, TX; SSgt. William Playford, NY; SSgt. James Picolo, NY; and Sgt. Charles Williams, OH. Finally, the details of the plane crash that killed my brother were being revealed. Week by week plans began to unfold. Ellsworth Air Force Base, formerly known as Ellis Army Air Base, was planning an annual air show for August 15, 1998. Ongoing contact with the military staff at Ellsworth brought into being the inclusion of a memorial ceremony honoring the men of the B-17F who died at the base in 1943. On August 13th, three weeks following the death of my mother, I boarded a plane in Nashville, TN, with four family members of SSgt. Sam Compton, Sr. Two others from California would join us in Rapid City. Upon changing planes in St. Louis, MO, Mike Stowe joined us for the continued flight. Without Mike’s experience and knowledge regarding accident reports, none of us would be taking this journey. He had uncovered the military reports concerning the plane crash on June 17, 1943. Arriving at Ellsworth Air Force Base on Friday morning, our group was greeted by commanding officers and their staff. We had been invited to their open house and annual air show, “Dakota Thunder.” Following a briefing about the weekend’s activities, we were escorted to the east/west runway where the B-17 had crashed in 1943. The runway was abandoned after World War 2. Emotions were running high that morning as our party of eight walked the pavement of the old runway. Grass was growing in the cracks. I paused to watch as a B-1 flew overhead. A few yards away, I spotted a long, deep crevice which had once been the pond that caused the plane crash in 1943. The location was behind a fence on property owned by a local farmer. A small white farmhouse in the distance appeared to be the one shown in photographs from army archives. We completed our exploration and left the air base with our next destination being that of the farmhouse. The current owner might be able to provide information concerning the exact location of the plane crash. We drove across open fields until we reached the house. No one was home, so we opted to trek 1,400 yards toward the fence. Mike carried a metal detector with him and within minutes, a miraculous discovery would be made. Dozens of pieces of wreckage were found--melted metal, exploded 50-caliber bullets dated 1942, and small fragments from the exterior of the plane. We found pieces that even had serial numbers. The collection contained only what could be retrieved by digging with our hands. Photographs were taken of the area for Mike’s research in maintaining the final position of the plane. Emotions transcended among everyone but all was quiet as we drove away from the farm. Returning to the air base again Saturday morning, we joined staff and guests for a VIP breakfast. Afterwards, a shuttle bus transported us to the site of the annual air show which began with one vintage plane after another taxiing down the runway. The U.S. Army Parachute Team gave a marvelous free-fall performance. The team was named Golden Knights because of their superb mission accomplishments and performance beyond the call of duty. I watched as three men jumped from a small plane above the airfield. To honor those who died in 1943, the third man, representing the missing man, moved away from the other two. A baton was passed between the two parachutists. The baton was later presented to Sam Compton, Jr., son of one of the six airmen who died in 1943. Sam spoke to an audience numbering up to 50,000, reminding them to never forget the men and women of WW2 who made the ultimate sacrifice for our freedom, whether on the battlefield or at home. Various guests expressed interest in the purpose of our visit to Rapid City. A gentleman who was intrigued by our mission made arrangements for us to be interviewed by “The Rapid City Journal”. Having just turned 18, he had driven to the farm adjoining Ellis Army Air Base to break the news to his uncle that he had enlisted in the Navy. The two men were sitting at the kitchen table preparing to eat lunch when they heard a loud crash. The house vibrated and the windows rattled. They rushed out the backdoor in time to see an aircraft explode, tossing flames and debris hundreds of feet into the air. Running across the field toward the plane, the farmer suddenly fell to the ground and yelled for his nephew to do the same. The young man continued running a few more yards, then realized bullets and ammunition were exploding like popcorn so he quickly hit the ground. They lay face down in the grass until they were safe from flying debris. At that point, they could see rescue equipment and people scurrying back and forth in the distance. After 55 years our mystery was solved. 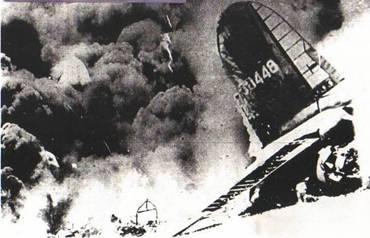 I was satisfied to close the books on the crash of the B-17, #230448, of June 17, 1943. 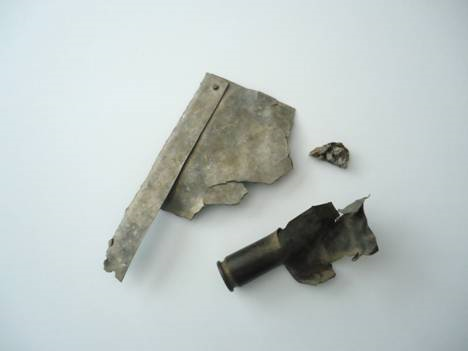 In August 1998 with the use of a metal detector, these items were found at the crash site of the B-17F bomber, at Ellis Army Air Base, Rapid City, South Dakota. Shown is a spent bullet dated 1942, a piece of metal from the burned plane, and a small melted clump of metal. Many pieces of debris were found. These were among the remains of the airplane embedded in the soil at the edge of a farm, and the end of the air strip where the B-17F plane crashed on June 17, 1943. Copy of photo from Army Air Corps Archives. Burning B-17F bomber after crash at Ellis Army Air Base, Rapid City, SD, June 17, 1943. Photo of Howard Estep (second from Left). One or two of the men may have been friends from Corbin. Smoke from burning B-17B, Rapid City, SD, June 17, 1943. 2. Article from Rapid City News Journal, 1943. 3. Photo of Howard Estep, age 21, Army Air Corps. 1943. 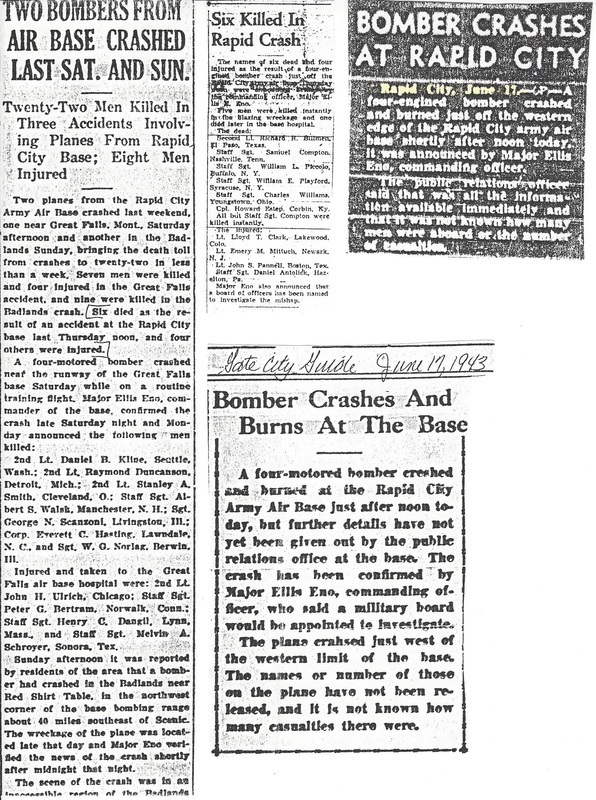 News items reported in the Corbin Newspaper, June 1943. Partial article from the Rapid City Journal was an interview of a crew of eight who visited the air base in August 1998. Those interviewed were Sam Compton, Jr., from Hendersonville, TN, his brother, Ron, and sister, Peggy Crosby, former wife of Phil Crosby, son of Bing Crosby. Sam, Ron, and Peggy were the children of Samuel Compton, Sr., who died after escaping the burning plane. Patricia Estep O'Neal was also interviewed. She was the sister of Howard Estep, Corbin, KY. Mom and Dad standing beside grave of son, Howard Estep. ca.1944. Pat O'Neal sent excerpts from her book Room at the Foot of the Bed. These are a unique glimpse into the life of Howard Estep. For your interest and the people who are following your project regarding the 44 soldiers whose names are displayed on the monument at the Central Middle School, I am including chapters from the family history I have researched and documented in the story about my family. I am sending these stories from my book to illustrate the short life of my brother, Howard Estep. 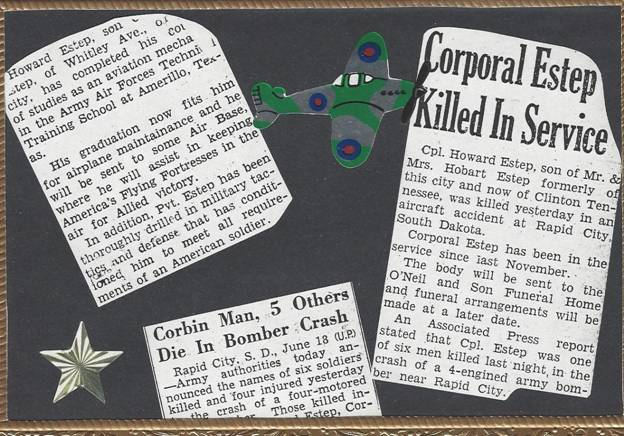 Howard died in a B-17F bomber crash on June 17, 1943, at Rapid City, SD. He was survived by his parents, seven sisters, and one brother. None of us kids knew what it was like to get an allowance. If we wanted extra spending money, we worked for it. Nothing was free. Bug earned his spending money by delivering the newspaper. Since he started smoking that was the only way he could buy his own cigarettes. He knew Daddy wasn't going to waste his hard-earned money on such wasteful things, even though Daddy himself once had the cigarette habit. .
On Sundays, Bug had to complete his newspaper route and get home in time to go to Sunday school. Missing church services, to Daddy, was inexcusable in our household. He would wake Bug early for his paper route, and tell him he'd better get back in time to go to church. If Bug was late getting home, and sometimes he was late on purpose, he didn't have time to get ready for Sunday school. Daddy would put him in the bathroom for punishment and tell him to stay there until we got back from church. Bug would head for the bathroom with his harmonica hidden in his pants pocket. Daddy didn't realize Bug welcomed the punishment. He would sit in the bathroom and entertain himself by playing the harmonica. Occasionally, Mama stayed home from church to prepare a big dinner for the family. She always felt sorry for Bug when Daddy punished him, so she would let him out of the bathroom after Daddy left the house, and when they saw his car coming down the road, Bug would hurry back to the bathroom and pretend he had been there all along. At the age of fourteen, he took a job in south Corbin, working at the Eveready Café, waiting tables and washing dishes. He didn't tell Mama about the job. Each morning he left the house with the other kids walking to school. They separated about two blocks from the house and Bug headed for the cafe while his friends continued on their way to school. The owner of the cafe let him leave work early in the afternoons so he could meet the other kids as they journeyed home. His friends would brief him on the school work and other happenings of the day, and he would arrive home at the same time every afternoon. This went on about three weeks without Mama catching on. He had her fooled until one of his friends slipped and told her. She was disappointed, but not surprised. Bug dropped out of school in the ninth grade. While the older girls were in high school, there were very few summer activities for them. Mama wouldn't let them go swimming, even though the only places they could swim were at the YMCA gymnasium or at Cumberland Falls, which was a definite no-no, because a neighbor's eighteen-year-old daughter had drowned below the falls. Bug was with a group of friends that day on the beach below the falls. They were sunning themselves while others were swimming. The girl got caught in a swift whirlpool that pulled her down into the deepest part of the river. They were totally helpless to save her. After supper, Inez, Ada, Velma, and Bug would gather on the front porch where the air was cool in the evenings and the sun would be setting behind the hill. Bug would reach for his guitar, and the four of them harmonized to familiar tunes. Their voices blended beautifully. Neighbors would venture out onto their porches a few at a time to listen to them sing. When the music ceased, the neighbors knew it was bedtime at the Estep house, so they, too, stretched their arms and gave a deep yawn. It was bedtime for them as well. On midsummer nights, it was so hot and the air was so still that nobody could sleep. Ada and Bug would sneak out of the house with their pillows and a quilt and lie under the big poplar tree in the back yard. The soft trickling sounds of the water could be heard from the branch down below. As they lay on the quilt in the quiet of the night, they would begin singing. Mama could hear them from her bedroom window. She would lie in the dark and listen as they harmonized. When they began Tumbling Tumbleweed, she would forget about the heat and humidity as she absorbed the sweet melodic sounds of her favorite song. In our house sisters gave no thought to sleeping with their brother. He was the only boy in the family at the time and everyone had to share beds, sometimes sleeping three to a bed. If relatives came to visit, we kids even made room at the foot of the bed for our cousins. It was a cold winter night and Bug and Janette were sharing a bed in the front bedroom. The bed had been pushed against the wall because Bug was a sleepwalker and had to be watched closely. My sisters took turns sleeping with him to prevent him from getting up during the night and walking in his sleep. It was late in the night. The house was quiet. Suddenly, everyone was awakened by a loud thud followed by the shattering of glass in the front bedroom. The ruckus brought them out of their beds and to their feet. Daddy was the first to appear in the bedroom. He turned on the overhead light to discover Bug's side of the bed empty. Janette was sitting up on her side of the bed shivering from the cold. The window was broken and the screen was lying on the ground. It was obvious what had happened. Bug was sleeping on the back side of the bed and dove through the closed window. There was no time for Daddy to get dressed. He immediately opened the front door and went running out the road in his long underwear. As usual, Bug had been dreaming when he plunged through the window and the screen. Daddy caught him about halfway out the road and led him back to the house. Mama was waiting at the door. As Daddy led him onto the porch, Bug's chin was bleeding profusely and his nightshirt was soaked with blood. Mama sat him in a chair behind the still warm stove in the living room then rushed to the bathroom to get wet washrags. She removed his shirt, washed the blood off his face as best she could, being careful to remove fragments of glass from his chin. She bandaged his chin and led him to another bed. During the entire course of action, Bug did not wake up. The next day Mama took him to the doctor. A clamp was placed over the gash in the curve of his chin. The cut left a small vertical scar. Bug would not reveal to his friends the real story of how he received the scar. He knew they would tease him. Bug married Marjorie Rogers in 1941 and they had a new baby daughter who was born August 26, 1942. Her name was Ruth Diane. In the fall of 1942, Bug joined his friends and enlisted in the U.S. Army Air Corps. Margie and their newborn, Diane, would live with Margie’s family in Stanton, Kentucky, while Bug served his military duty. The only thing people talked about was the war. It was a major concern in every home. Of the few young men still at home, most of them were waiting to receive their draft notices. The Great Depression of the 1930s affected the state of Tennessee in much the same way as other states. City dwellers returned to farm life to survive. Tennessee was already a farming state. The creation of the Tennessee Valley Authority (TVA) in 1933, and building of power generated dams, made life a little easier by providing electricity to rural households. TVA laid the groundwork for industrial growth. When President Roosevelt created the Federal Employment Relief Administration to aid in unemployment, he also created the Works Project Association (WPA), a name that would become very familiar to every family. The largest expenditure of the WPA went to the expansion and improvement of state highways, streets and sidewalks in towns. State parks were built and improved to create and attract tourism. By the early 1940s, women began learning trades in industry that had previously been duties of men. In early spring of 1943, jobs were practically impossible to find. Like many others, Daddy had been out of work about four months when he learned about a new government project in Oak Ridge, Tennessee that was hiring thousands of men. He applied for a job and was hired as a supervisor for a construction project. Before long, the newly created town would become a common household word. People knew an important military project was being conducted by the Government, but no one knew the real purpose of the immense operation. Providing housing for the families coming from all parts of the United States was an immediate concern for the surrounding communities. Automobiles were arriving daily pulling their own mobile homes. Other families came hoping to find housing. Men arrived, leaving their families back home. People weren't particular where they lived as long as they had a roof over their heads, running water, and clean warm beds in which to sleep. The small town of Clinton, about eleven miles east of Oak Ridge, would be our home for the next two years. The town had a population of nearly 7,000 people, and as many as 3,500 more families were moving into the community. Fortunately, Daddy found a house for us to rent only a few blocks from the center of town. The rent was $45 a month. Janette, Wanda, and I, would finish out the school year in Clinton. Bena Mae and Velma stayed behind in Corbin. They would live with Inez. There is no fear like the sound of sirens careening through the night during wartime. Through the years I have seen many movies regarding the wartime period in Germany, Britain, Belgium, France, Japan, and other countries. Movies were about the Nazi invasion and bombings of small villages, people running through the streets to safety, and many huddled in corners and doorways when loud sirens sounded, warning people to seek shelter. Bombs exploded all around. Watching those movies, I could remember the feeling of fear that comes to a person at the sound of those sirens. During the two years we lived in Clinton, we had frequent blackout drills, occurring late at night. The sound of the sirens was extremely loud and seemed to last forever. The sirens came from the Magnet Mill directly across the street from our house. They were nearly deafening to us because the sirens had to be heard throughout the whole town. We never knew when to expect a drill, but when the sirens began, every light in every home was immediately turned off. Shades were drawn, curtains and draperies closed, and motorists stopped their automobiles and turned off their headlights. The streets were patrolled by local security to make sure there wasn't a single light on in the town. The drills were to prepare residents in the event a real enemy air attack occurred. Oak Ridge was the number one enemy target. We could not be caught off guard. We could not afford another surprise attack like Pearl Harbor. In the wintertime all of us kids would huddle in the floor near the living room grate and wait for the siren to end. We sat as quiet as church mice in the dark with the flickering firelight casting our shadows against the walls. We trembled constantly waiting in fear of the unknown. We kids were too young to realize the significance of the drills and the dangers of living near Oak Ridge, but we weren't too young to imagine what an enemy attack would be like. We were quite familiar with the stories about the bombing of Pearl Harbor. It was late at night, July 6, 1944. Families were preparing for bed when the sirens began. It must be another blackout! We had become familiar with blackouts. This time, the sirens went all night long. Lights flashed across the sky, all night long. Communication wasn’t the same as we know it today. You couldn’t turn on a TV and get an instant replay. People stayed in their homes. No one was allowed on the streets. So, all that night we sat in fear waiting to learn what was happening. The Japanese had bombed Pearl Harbor in 1941. Had they returned to attack the small area in and around Oak Ridge, Tennessee? Every family was frightened for their lives. Even my own family, as we sat in the dark before the grate fireplace. Sirens sounding throughout the night came from The Magnet Knitting Mills located directly across the street from our house. The Mills had once manufactured nylon hosiery but was currently being used to manufacture parachutes for the war effort. The shrills were so loud we could not hear ourselves talk. Lights were not allowed in any of the homes or headlights from vehicles on the streets. Mama pulled the darkened shades on all the windows and drew the draperies closed so that the light from our fireplace could not be seen from outside the house. My sister, Wanda, age ten, and I, age eight, sat huddled before the fire. We didn’t dare say a word for fear our voices could be heard on the street. Our house sat parallel to the sidewalk. Mama walked the floor, wringing her hands. 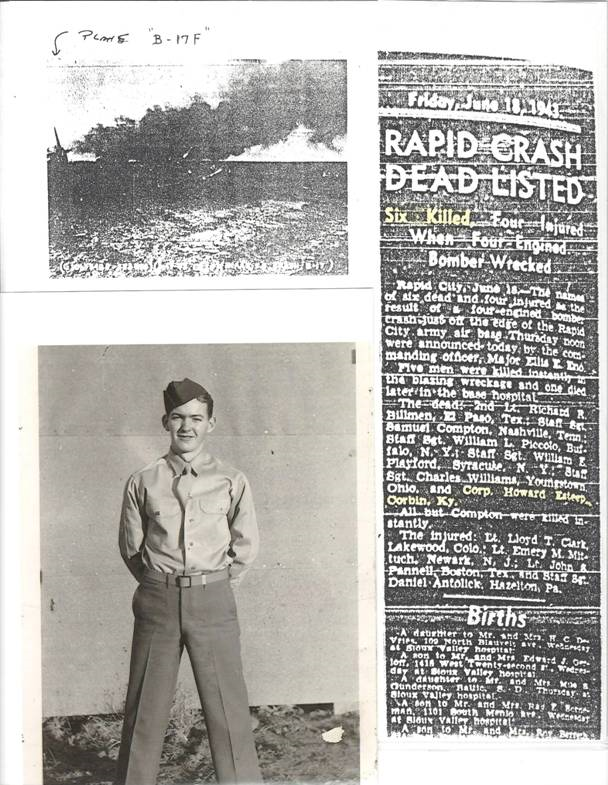 My brother had been killed in a B-17 bomber plane crash the year before and it took very little to upset my mother in terms of reports of the War. Nobody in the household was willing to go to bed. Every few minutes we peeped through the curtains where we could see the huge lights flashing across the sky, back and forth, back and forth. Police cars were patrolling the streets. There is no way to describe that kind of fear, fear of the unknown! Throughout the night, we waited. A troop train carrying more than 1,000 soldiers just out of basic training had left Louisville, KY, and was headed for South Carolina. It was about nine o’clock at night and soldiers had removed their shoes and uniforms, preparing for a few hours sleep. The train was 30 minutes behind schedule and the engineer needed to make up the time. The train approached the mountains of Jellico, TN. The tracks wound through the mountain bordering a 50 foot gorge and river below. If a train traveled more than 35 mph it stood the chance of never making the sharp curve at a place called“The Narrows”. In order to make up time, the engineer kept the train traveling at a high rate of speed. The train jumped the tracks. Five cars went into the river gorge. The kitchen car caught fire. Bodies were scattered everywhere. Approximately thirty-six soldiers and the engineer and fireman were killed. As many as two hundred soldiers were injured. The first person at the scene of the accident was a local doctor stopped by a soldier in the middle of the road wearing only his underwear. The banks of the river were so steep, the doctor could not pull the injured to safety. A truck came along and stopped. The driver filled his truck with ambulatory and injured soldiers then returned to Jellico to bring back help. Ambulances were called from the five surrounding towns between Knoxville, TN, and Corbin, KY, a ninety-mile radius. Every restaurant opened its doors and depleted the shelves of bread and food for the soldiers. Women throughout the town made sandwiches, snacks, drinks, provided hot coffee, anything to help the hundreds of injured soldiers. Boy Scouts and the Red Cross gathered shoes and clothing. They carried blankets and clothing to those still at the accident site. Families took soldiers into their homes. Rescue efforts went on for three days. One woman sat at the edge of the river holding a young man’s head above the water until he could be brought to safety. Another lady held a trapped soldier’s hand for hours until he was released and then he died. Others drowned along with the engineer and fireman because they were trapped by train cars in the water. Sirens continued throughout the night. Those who could help in this tragedy, did. Others remained in their homes and prayed. This was the second worst train accident during World War 2. Very few people today can understand the feelings of this kind of fear. They don’t realize the meaning of prayer until they have had an experience so devastating as loss of lives during war time. If you want to see people come together, giving their all, you have to know what it is like to feel this fear. We received letters every week from Bug telling us about his training activities. He kept Mama informed each time he was transferred to a new air force base. She worried about him all the time, being so far from home. It was Mama's nature to be concerned about him having enough to eat. Bug always assured her that his food was fit for a king. He was one of several enlisted men who had been given the privilege of eating his meals in the officers' private dining room. He wrote about the comprehensive written exams and drills he had to undergo each day. As many as 300 specially-selected airmen were training to be pilots and mechanics, and he was one of them. Even though Bug had disappointed Mama and Daddy when he dropped out of school in the ninth grade, he was making it up to them by proving his capabilities. He was at the top of the list on every test score. He told us he had to be able to take a plane completely apart and assemble it again, piece by piece, before he could pilot his own plane. He would be flying a B-17 bomber, which, to him was superior to all other military planes ever built. He would write, "Mom, you don't have to worry about anything happening to me. I'll be flying the safest plane in the world." In another of his letters he wrote, "I wish Dad could see me now, sitting in the pilot's seat of a B-17 Bomber. And to think, he was afraid to let me drive his car! Ha! Ha!" Bug was proud of his small contribution to the war effort. Since he and Daddy had not had what some might call the ideal father/son relationship during his teenage years, Bug was quite anxious to make Daddy proud of him. In one letter he told Daddy about the planes that had been grounded in Africa several days because of malfunctions. No one knew how to make the repairs. I could just imagine the gleam in his eyes as he said, "If I had been there, I could have made the repairs and had the planes flying again in five days." There were letters from Miami, Florida. His lodging was in a house that had previously been owned by a wealthy family. It was located next door to the famous nightclub called The Flamingo. Bug said Clark Gable had just appeared there and they were expecting Robert Preston the next week. The letter didn't say whether or not he got to see the shows. 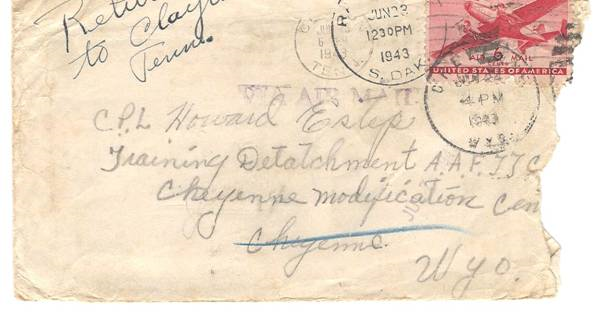 Ongoing letters were from Abilene, Texas; Seattle, Washington; and McDonald Air Force Base at Cheyenne, Wyoming. He barely settled in at one military base until he was being transferred again. For the first time in his life, Bug had the privilege of traveling to places in the United States that every young man dreams of, but he saw very little of them. His time was spent on the Air Force base in training. We were really excited the day we received a picture from him that had been taken at an air show. Top ranking officials and generals were visiting the air base at the time. MGM Studios' cameramen were there to film the entire production. Words seemed to bounce off the page as we read that Bug marched past the grandstand, looking directly into the camera. About fourteen hundred men were pictured in the photograph. Bug had drawn a circle around his head. His picture was so tiny it looked like a dot among hundreds of others that looked the same. But that didn't matter. We knew it was Bug. He was a handsome young man, an airman who was dedicated to the freedom and safety of all Americans. The Air Force was lucky to have him as a member of the Corps. He would make his family and his country proud of his contributions. The required training was very stressful, but he never complained. He was pleased with his achievements. His studies allowed him only three to four hours sleep each night, and then he had to be up at five o'clock in the morning for marching drills. The respect and admiration he felt for his commanding officers was exceptional. He spoke of them with high esteem. In nearly every letter, Bug would ask Mama to send him money and cigarettes. She scrimped and saved to provide the few things he requested. Sugar was used sparingly so that she could make candy and send to him. He would tell her about sharing the care packages with his friends and how they appreciated her kindness. Bug knew how to make Mama feel good. Cooking was the one thing in life she did well, so all he had to do was brag about her. Sometimes his letters were addressed to Bena Mae and Janette. He would add a math problem occasionally as an example of the stressful exams he was taking. A note was sometimes written to Wanda, Don, and me. Bug was especially fond of Don. He would also include a few lines about how much he missed Margie and Diane. Since we had not seen either of them, he would tell Mama how pretty and sweet Margie was, and he knew Mama would really like her. He was right. It wouldn't be long before we would get to meet his wife. She resembled the movie star, Jinny Sims. Margie had a beautiful smile and a charming, outgoing personality. When her slender fingers met the piano keys, she could almost make the piano dance across the floor. She, like Bug, had natural musical talents. Daddy read the newspaper from cover to cover and listened to the national news on the radio every evening after supper. One evening, his attention was drawn to an article in the Knoxville News Sentinel concerning a plane crash that had occurred at an Air Force base in Rapid City, South Dakota. Ten airmen were aboard the plane and six of them were killed. No names were published. Anything regarding young men in the Air Force caught Daddy’s attention. He was relieved after reading the article knowing Bug was stationed at Cheyenne, Wyoming, and could not have been aboard the airplane. Bena Mae and Velma had chosen to stay in Corbin with Inez through the summer, so Janette, Wanda, and I shared a double bed in one bedroom. Don slept with Mama and Daddy in the other bedroom. Uncle Wiley had already been with us about three weeks. He had come all the way from Texas on a Greyhound bus to work in Oak Ridge. He slept on our sofa. We had been sleeping soundly when something aroused Janette and Wanda. My sisters were not in the bed when I awoke, so I went into the other bedroom and discovered my parents’ bed was also empty. All of the lights in the house were on. I had a sudden creepy feeling. Something was wrong. I crawled into my parents' bed and pulled the covers up around my neck. I could hear people talking in the living room. I saw the Taylors pass through the hallway from the back of the house. They were headed for the living room, also. I couldn't imagine why everybody was up so late at night, but from the commotion I heard, it had to be something serious. There were crying and moaning sounds. I didn't budge from the bed. I was afraid to go see what was happening. The next thing I knew, Wanda came running into the bedroom. She jumped into the middle of the bed with me and blurted out, "Bug's dead!" She showed no signs of emotion whatsoever, so I figured she was just teasing me. Wanda was always doing things like that. But in the middle of the night! And why would she tease me about something so serious? I could still hear crying coming from the living room, and by this time I knew it was Mama. My head suddenly felt as if it was filled with cotton. My body grew numb. At first I didn't believe Wanda because of the way she broke the news to me. I didn't want to believe her. But the crying sounds were real, so I knew she was telling the truth this time. I slid further down into the bed, pulling the covers over my head. My eyes welled up with tears and I fought to hold them back. Bug was idolized by his seven sisters and three-year-old brother. I cannot recall seeing my brother in dress uniform, but I knew he was the handsomest soldier in uniform. He walked straight and tall, and in the photographs Mama had of him, his hair had shiny black waves and he wore his hat over the part in his hair. His trousers were pressed until the creases were razor sharp and his shoes were spit-shined. Bug wore his uniform proudly and was dedicated to serving in the Air Corps to the best of his abilities. Shortly before enlisting in the Army Air Corps, he hitchhiked home from his job in Covington. I was in the back yard playing with Don when I saw him get out of a car on Poplar Street. He took the shortcut through the field to where we were playing. Bug liked to surprise us kids with occasional small gifts. The cost or size of the gift didn't matter because anything from Bug was always special to us. He worked hard and had very little money to spend frivolously. That day, he gave Wanda, Don, and me, each, a small matchbox filled with pennies he had been saving for us. We were thrilled. We weren't used to having money of our own. After we received the news of Bug's death, the following weeks would be the most painful and agonizing days my parents would ever experience. The death of Betty Ruth at age two, the loss of three newborn babies, and the passing of their own parents, none of these would compare with the heartache felt in losing Bug. He was so talented and loved by so many people. My older sisters had such heartwarming memories of their childhood together--singing, laughing, playing pranks, fibbing for each other, and, of course, fighting as all siblings do. They would always remember his love for music and the wonderful sound of his voice when he sang while playing his twelve-dollar guitar. Being seven years old, my pain would heal quickly, but the few memories I had of my brother would last a lifetime. Don was too young to remember the love Bug had for him, but the stories he would hear over the years would be like remembering them himself. The drive from Clinton to Corbin the next day was a quiet one. O'Neil Funeral Home had already been notified that Bug's body was being shipped back to Corbin for burial, so by the time we arrived there, everyone in town knew about his death. The notice had been given to the local newspaper for publication. Friends and neighbors were waiting for us with open arms and heart-felt warmth that existed in neighborhoods in those days. They had known my brother since his birth. The house was dark. Shades were drawn, and the lace curtains hung loosely over the windows. Neighbors and friends provided my family with food to last several days. I don’t remember seeing furniture in the living room, but I have a faint recollection of chairs lined around the room. The chairs were probably brought in by the funeral home. Ladies sat in the living room while the men stayed outside on the front porch with Daddy. The room seemed exceptionally dark to me. Bug's casket sat under a window against the outside wall and was covered with an American flag. The casket was too high for me to see over the top. It stayed closed. My parents were not aware that the casket contained only ashes. I remember Mama pacing back and forth through the house and occasionally slipping to the floor in faint. The ladies were always close at hand to apply smelling salts to revive her. I felt so alone and insignificant as I observed the goings-on around the house. I can't recall Wanda or Don being there, or my older sisters. I don't know where they were. Watching Mama taking on so, time after time, was beginning to get to me. I felt as if I would choke to death trying to hold back my tears. I eventually wandered out to the back porch where I could be alone to cry. Suddenly, there was a hand on my shoulder. When I looked up, it was Ida Smith. She had followed me onto the porch to comfort me. Ida was one of our oldest neighbors. She had been present at the births of most of us kids, and she seemed almost like an aunt to us. Her son and daughter grew up with Bug. It must have been late the same day when Inez took me to our cousin, Walter’s, house on Eleventh Street. While we were there, Tom and Virgie Thurston arrived with their daughter, Shirley. Shirley and I had been friends in the first grade. The Thurstons realized my family would have problems making sleeping arrangements since there were only one or two beds in the house, so they invited me to go home with them. They lived on Fourth Street, about two blocks from Central Baptist Church where funeral services would be held. I stayed with them until we were ready to return to Clinton. I slept with Shirley in her double bed. Her dad treated me like a special guest, making sure I wasn't reminded of my reason for being at their house. Since I went directly from my cousin’s house I didn't have extra clothes to wear, so Mrs. Thurston let me sleep in Shirley’s pajamas and the next day, I wore a little yellow, calico-print sundress of Shirley's. I loved the dress. After the funeral and burial services were over, my family picked me up to go back to Clinton. Mrs. Thurston gave me the sundress to wear home. I didn't attend Bug's funeral, and as I think back about the experience, I'm glad. I was only seven years old and since I had so few memories of my brother, I'm ever thankful they are all good memories. It was hard enough watching Mama as she mourned for him. I didn't need to be burdened with memories of her grief at the burial services when they gave the traditional twenty-one gun salute then folded his flag and presented it to Mama. Bug's flag has remained neatly folded and stored in a box since 1943. Mama kept the letter she received from President Franklin D. Roosevelt expressing his sorrow after Bug's death. Several years later, a monument was erected on the lawn of Corbin High School. It commemorated all of the young men from Corbin who gave their lives for our country during World War II. Bug's name is listed among many others. Bug had a $2,500 life insurance policy at the time of his death naming Mama as beneficiary. She was to receive monthly payments for the rest of her life. Every month for forty-eight years, a check came in the mail for $12.45. Her church tithe came out of the money. In the early 1990s, her allotment was increased to $21.00 a month, and increased again later. The $2,500 insurance policy has paid out well over $10,000 through the years. I would like to thank Mr. Estep's sister Pat O'Neal of Lexington, KY for sharing the story of her brother with us. She was more than generous with wonderful stories and details of a wonderful brother. Note that she has written her own family history entitled Room at the Foot of the Bed which has been published as a Kindle Edition on Amazon.com. You can go to Amazon and read a preview of the book.